Greetings to all you demo coders out there! I hope everyone is healthy and happy, and enjoying their coding projects! For this issue I've decided to discuss three dimensional mathematics and how basic "3d" is achieved. Many people tend to "gloss this over" - because they don't feel that they need to fully understand it. There are countless postings in forums from people that are struggling with "gotchas" in Direct X and openGL because they have neglected to master the basics. Let's master these basics and avoid future struggles! In this tutorial I'll be teaching you to make wire frame renderings. We'll do the math ourselves, with basic trigonometry. If you understood my last tutorial, you are in good shape. If you didn't follow my last tutorial, have a look! You can also use this refresher on the web: "Trigonometry: A Crash Review". Check it out here: http://www.zaimoni.com/Trig.htm. As usual, we'll be using Dev C++ and Allegro. Look at older tutorials for refreshers. With every tutorial, feel free to me questions directly if something doesn't make sense: Polaris@northerndragons.ca. Don't forget to tell me what you would like the next tutorial to be. I can't meet everyone's needs - but I'll certainly try to. The Cartesian Coordinate system was developed by the French mathematician René Descartes. It's rumored that he was sick in bed and was watching a fly buzzing around his ceiling made of tiles. He didn't have the strength to move to swat it; so he noticed that he could the count tiles from a specific tile (up/down and left to right) and remember where the fly was to kill it in the morning. You can imagine pirates doing the same thing with a land marker. "YAARRGH: From the scull rock, the treasure is 2 paces north, and 5 paces east". The origin is the center of where we start measuring from (in that case the scull rock). While we don't have evidence that it was a fly that inspired his mathematics - Decartes' contribution in 1637 was enormous. It's this contribution that all three dimensional mathematics is based upon, and gave birth to analytic geometry. 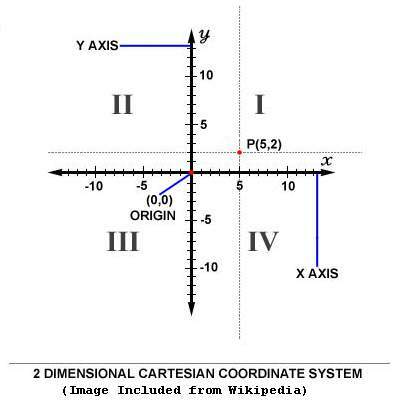 While it should be review for everyone.. here are the basics of the two dimensional Cartesian coordinate system. The idea is to divide motion into two components. These are called axes. This is similar to a computer screen - where you have Screen X (left to right) and Screen Y (up and down). Each axis is like a ruler; measuring distance along that axis. Every point can be represented by its X value and Y value. You intersect the two X,Y values - and you know exactly where the point (or fly) lies. This pair of values is called a coordinate. The computer screen co-ordinates are setup slightly differently than their mathematical pure counterpart. In computer graphics the origin at (0,0) is typically the upper left of the screen, whereas in mathematics - the origin is in the center. In screen units, as you grow in Y co-ordinates... your Y value goes "down" the screen... which is exactly opposite to the conventional Y axis in mathematics (upside down). In the end, this will mean that we'll have to transform our mathematics to the "screen coordinate system". Usually this is the very last step of any 3d application. We've already done screen coordinate transformation in the last tutorial on lenses. Points? It's all about Points? What's the Point???? So far, I've made a big deal about points. This might seem very trivial, but it's not. Objects in our three dimensional world - can be represented by points! Imagine a cube a moment. 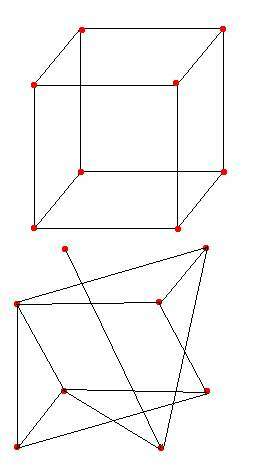 A cube has eight outside edges - where its surface comes to a "point". When we sketch out a cube - we imagine these points connected with lines. 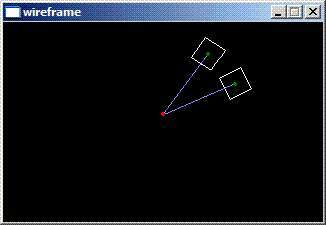 This type of basic rendering is called wire frame (as shown in the picture). You should realize that we aren't drawing just any lines. Instead we are connecting lines that are part of the same surface (same shape). In the image, you can see a "cube", as we normally think about.. and a weird object that shares the same points, but is connected in an arbitrary way. So, it's not just about points, but putting those points together as part of a surface. Any three dimensional surface can be approximated by putting together flat shapes. This is like Origami (the art of Japanese paper folding). To make a cube, we take six square shapes and arrange them to form the cube. For a three sided pyramid, we take 4 triangle shapes (one for the bottom) and arrange them to form a pyramid. 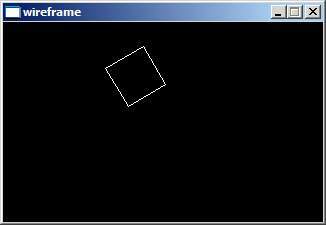 These flat shapes are generically called polygons, and can be any shape (triangle, square, hexagon). The strictest definition would say - a polygon is a flat shape bounded by straight lines. 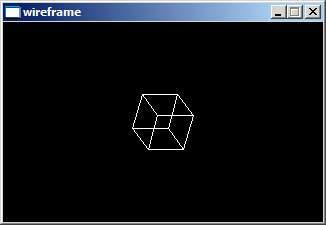 You could render a filled cube (not wire frame) by drawing the six sides (squares) of the cube and filling them in. This would look similar to old style polygon graphics of the 1980's. Right now we are doing the same thing, but we aren't bothering to fill our shapes in. Each of the six sides equates to a single polygon. For now, we'll focus on just defining wire frame objects and rendering them so they look proper. We can't represent these points mathematically, unless we have some way to measure them. This is what coordinates are used for. Later on we can take the coordinates of an object (like our cube), and rotate them; move them around etc (by using basic math). This is what enables us to have virtual universes in our computer games and consoles. Descartes Coordinate system was first envisioned as a two dimensional one. An easy extension however is to add another measuring stick - the Z axis. With X,Y, and Z... we can represent any three dimensional point. These equate to (from a viewer position) - left and right, up and down, and forward and backward. You can imagine a string hung from Descartes' ceiling, with markings at the same length as the ceiling tile. This would allow him to measure how far down the fly was hovering from the ceiling. You would need the position of the fly in relation to the three axis: X (left, right), Y (up, down), Z (forward and backward). 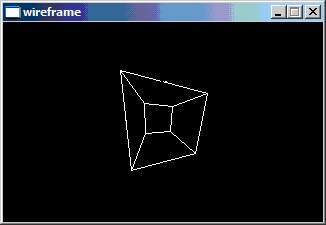 Our three dimensional origin then becomes (0,0,0). Oddly enough, mathematics never fully standardized (in my belief) which way "Z" is measured. If you are holding a coordinate system directly in front of you, looking towards origin.... does Z increase as you walk forward, or does it increase as you walk backward? It turns out that this was never fully decided. Mathematicians found each definition useful in some cases. Instead of forcing a standard, they came up with two coordinate systems. (Making each a standard.). The left-handed coordinate system works like this. You take your left hand, with your palm facing upwards. You point your fingers in the direction of the positive X axis (to the right). You curl your fingers into the direction of the positive y-axis (up). Your thumb now points in the direction of the positive Z axis. This means that Z grows as we "walk forward". The right-handed coordinate system works almost the same way. You take your right hand, with your palm facing upwards. Again, you point your fingers in the direction of the positive X axis (right) and then curl them to the positive y-axis (up). Your thumb now points in the positive Z axis. With the right handed system... Z grows as we "walk backward". To add even more hilarity, computer graphics API's couldn't decide on a coordinate system (right or left) to be standard either. Open GL uses a right-handed coordinate system, while Direct X uses a left-handed coordinate system. I'm going to use the left-handed system for the remainder of the tutorial. This means that point <0,0,-10> is in front of the origin, while point <0,0,10> is behind it. I realize this is confusing now, but as we work with it - it should make more sense. I mentioned above that the computer's origin system starts at the top left of the screen, at coordinates (0,0). X grows from left to right, which matches our pure mathematical definition; but Y is upside down (growing as you go down). We did some screen coordinate conversion in the lens tutorial, but let's define it here more generally. The most fundamental thing we need to do is move the origin. The important thing to remember is that the origin can be anywhere we want it to be. It's the one thing that's stationary - the "skull rock" that the pirate assumes won't move. We need to adjust the origin in our math coordinates to be the center of our screen coordinates. We'll define our x_origin_offset to have a value of 160 (for mode 13h), and the y_origin_offset to have a value of 100. Shapes and Objects - Getting Curvy. So far we've shown how a cube can be composed from points - which make up surfaces. In other words, we can build a cube from squares, and squares from points. You might think that this means that we can only render sharp shaped objects with our system. How do you make a curve with only points and straight lines? The trick is, that you don't. It's impossible to truly represent a curve with points connected by straight lines. Instead, we do the best we can by adding more points and lines to approximate the curve. The more points we add along the surface of the curve, the better our shape will appear. You can see this with the shapes that approximate a sphere. In the low polygon sphere, we've only got 3 shapes (or polygons) visible, that give it a "curvy" look. In the higher polygon sphere, we've added more shapes, points and lines. 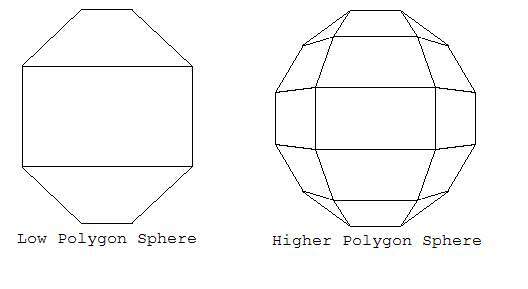 As we continue to add more polygons, the sphere becomes more and more defined. 1. Defining a object points. 2. Converting the co-ordinates to screen coordinates. 3. Drawing the object on the screen. Similar to my last tutorial, we'll start with an basic framework. If you haven't seen the framework before or are unsure - review the previous articles. 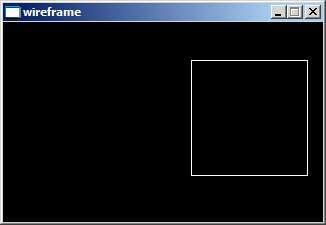 You can get the framework in zip format: wireframe.a.rar in the bonus pack. We will apply our changes to Wireframe.a, step by step. You'll notice I'm using rar files, which are just like zip files. To extract them you can download winrar from http://www.rarlab.com/. 3. At this point we'll add a routine to draw a Wireframe polygon. Let's write the DrawScreenCords2d routine. It will take a bitmap object (to plot on), a Vector2d array (what to plot), a colour (how to plot it), and a total # of points (how many to plot). It will draw a bounded shape of lines for all points. At the end it will connect the last point to the first point, a feat achieved using the modulus operator. As screen coordinates are integers, I've typecast them to integers from floats. (truncating them to screen coordinates). // converts mathematical points to screen points and plots them. // point b, point b connects to point c, and point c - connects to point a. 4. Now we need to add our points to the main routine. I've done that right at the beginning. Notice I'm also adding the variable lOffScreen to hold the double buffer. 5. Now that we've allocated our points, we need to draw them in our render loop. We also need to allocate and destroy our off screen render surface. This is added as follows. Provided that everything goes according to plan - we should now be able to compile the code - and enjoy our first Wireframe rendering! So far we've been able to create a beautiful square... that does noting except exhibit perfect square-ness. It would be far more interesting if we could get our square to do things. There are three fundamental transformations for all objects - Translation, Scaling and Rotation. (also known as S.R.T). I'll define each one in turn, show the mathematics used for achieving the effect and extend our square wireframe program to really dance. We will start with Translation because it's the simplest transformation. 1. Our first step is to add a translation routine. I've done this just above the drawing routine. // occurs at the time of drawing. 3. We also need to set our x_pos and y_pos to an intial value. I've done that right under the create_bitmap used for the off screen buffer. 5. Voila. Our cursor keys are queried by the if statements, adjusting the y_pos and x_pos variables. The lSquarePoints are translated by Translate2d, and the results are stored into lTranslatedPoints. Scaling an object isn't much different from translating it. With scaling, instead of moving an object by X,Y or Z values - we stretch (or compress) an object in X,Y,Z values. We do this with a scaling factor. Scaling an object by 0.5 will shrink it by a half, scaling by 1.0 will remain the same, and scaling by 2.0 will double the object. When I say "double / half etc".. I'm referring to the distance between our vertices. Remember we don't have to scale an object in all three dimensions simultaneously; it's possible for us to scale our square by different values for the axis - creating rectangles or other alternate shapes. Scaling is most often thought of as a general object modifier (changing height, width and breadth simultaneously), and we'll code it just like that. At this point we'll code our scaling routine. We will also combine it with the translated values, allowing us to scale and translate our object. Our changes will look very similar to our translation code, with only a few exceptions. 1. Our first step is to add our scaling routine. 3. We need to initialize our scale (at the same place that we initialize x_pos and y_pos). 5. Voila! Our q and a keys now scale our object, and our cursor keys now allow us to translate it. Rotation is our most difficult transformation. While I'll explain how the rotation formulas work on the inside, you don't need to understand them to make use of them. Remember, all we need to do is think in terms of points - lines and surfaces will follow. To make things even simpler, I'll focus on top down rotations (just like our 2d graphics here). Rotations are defined by two fundamental things. 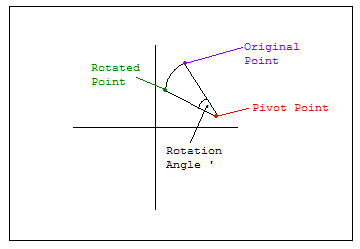 The pivot point (where we are rotating), and the degree of rotation. As we'll need to use trigonometry to calculate our rotations - our degrees will not be in angles... but instead will be in radians. Radians are just another unit of measure of angle. Radians are based on the value of PI. In radians, PI represents a 180 degree rotation. Similarly, 1/2 PI is a 90 degree rotation. Imagine this to be just the same as exchanging currencies. One currency is called degrees, and the other is called radians. 180 degrees is roughly 3.14 Radians (a truncated value of PI). Degree = (Radian / 2PI) * 360. (Where 2PI == something like 6.28). Now, to simplify matters - we are going to develop our formulas with the pivot point at the origin. This doesn't change our capabilities, if we wanted to develop a rotation formula to have an arbitrary pivot point, we still can. In that situation we'd use translation to move the pivot point to our origin, perform the rotation, and then reverse the translation to move everything back to the pivot point. Since our simplification doesn't change our capabilities - we'll setup our formulas to pivot around the origin. Our first rotation formula will be the standard 2d rotation. We will consider each rotation in terms of axis. To start with, we'll define a Z rotation - which is the standard rotation for a top down / traditional 2d view. It's like someone glued our object to the Z axis and then twisted the Z axis by the degrees desired. Our other rotations will be for the X and Y axes respectively. Let's define our rotation formulas. Aside: For those familiar with my articles in Hugi - the following definitions will seem very familiar. They should - because they are identical to my Article in Hugi 27 (Sphere Tessellation 101: "The Art of Making Spheres out of Triangles"). If you are interested in seeing another application of these formulas (to build spheres etc) - check it out. Diskmag version: http://hugi.scene.org/fate.php?page=hugi27). For each rotation around an axis, there are two equations. There isn't a third equation, as when you rotate around an axis, your value for that axis (x,y,z) does not change. For example, your Z value for a point will not change if you rotate a point around the Z axis. Etc. Did you take my word on it? I didn't think so. So, let's look at one of these in detail. Just realize that all you need is to know how to apply the formulas. Knowing how it works is just a bonus. 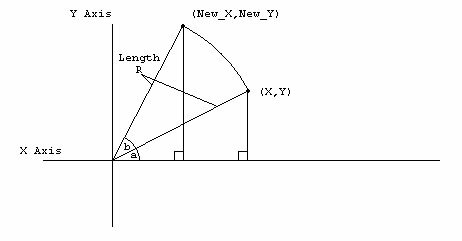 In the diagram, we are rotating point X,Y by angle B. We start however at angle a. Now, let me introduce some trigonometric identities. [Take my word on these okay?]. That covers off our rotation formula for Z axis rotations, X and Y axis rotations are quite similar; so I'm not going to define them here. It's far time that we made something rotate! 1. Our first step is to add our rotation routine. 3. We need to initialize our rotation (at the same place that we initialize x_pos and y_pos). 3. Voila! Now we've got our cube rotating as we'd expect. You'll notice that the picture shows that our rotation - is now in the center of the object. Entering the Third Dimension - Perspective and Orthogonal Views "AKA - What to do with Z?". At this point we are on the cusp of taking things into the third dimension. We have the math, and the routines to do the graphics; but one question lingers. "What do we do with Z?" At this point in time, we don't have many three dimensional displays on the market. So, in truth... three dimensional graphics are never actually three dimensional. They become flattened by the screen they are projected on. We need to find a technique to "squish" our mathematics into our flat screen. The act of squishing our three dimensional object is like creating a projection of the object. There are two common projection techniques. 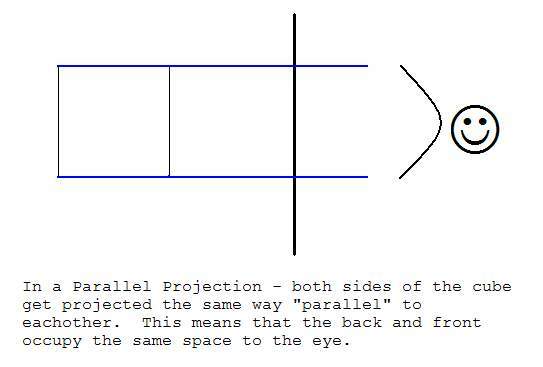 A Parallel Projection is the simplest projection. Essentially we drop the Z out of the system all together. This will be our first projection project. The problem with a parallel projection is that it doesn't care about how far back our objects are. If a object is 40 units wide, it will take 40 units on the screen no matter how far from the virtual viewer it lies. 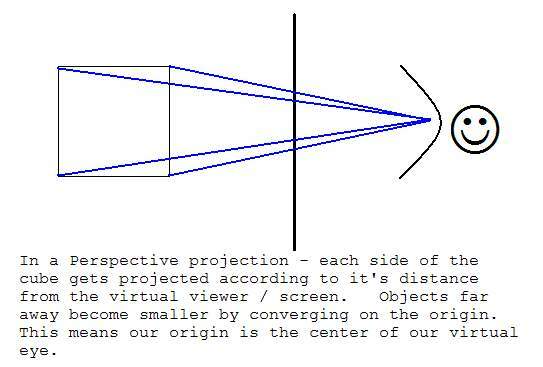 A perspective projection is a little more sophisticated. It takes into account or depth from virtual viewer (situated at the origin), and results in a perspective. This is the same technique that artists use when painting and sketching. This will be our second project. 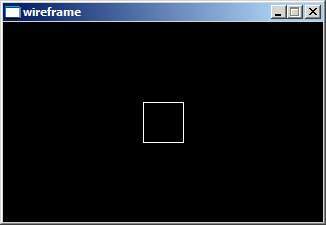 For better understanding, consult the pictures that show a Y / Z oriented view. The face is looking down the Z axis, centered around the origin. The black line represents the computer screen - and the curved line shows light being caught by our virtual eye. Let's Get Some Three Dimensions! At this point, we need to extend our square to be a cube - and draw it to the screen. The simplest thing to do is go back to our wireframe.a.rar, and build our 3d project from basic principles. We are going to take a basic cube - and allow it to be rotated with the cursor keys. We'll just do X,Y rotations to illustrate the concepts. 2. Our next step is to extend our structure to allow for three dimensional objects. // X is untransformed, just recopied. // Y is untransformed, just recopied. // point c - connects to point a. 5. We now need to define our cube. It's like a square - but with a lot more points. You'll notice I'm keeping things simple for our drawing routine and repeating points for every surface. That means points 0-3 form one surface, 4-7 form the next, 8-11 form the third... etc. This recopies a lot of points (which isn't good), but is sufficient for showing how things work. 6. We need to add variables to hold our angles. These will be to measure X axis rotations and Y axis rotations. 9. Voila! That took a few more steps, but you can now enjoy a rotating 3d cube. You'll notice that the drawing loop is set up to draw surfaces of four vertices each. If you need to catch up or compare, download wireframe.g.rar. 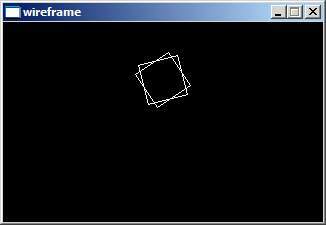 While it's finally great to see a rotating cube; when you first start the program with no rotation - all you will see is a square. That's because the first surface is identical to the second surface in a parallel projection. Now we need to compensate by adjusting the size of objects that are far away. We do this by centering our world against the origin. We shrink things that are far away; keeping things nearby unaffected. Our newly adjusted far away points "converge" on the origin, giving the view perspective. It's not nearly as hard as it looks. 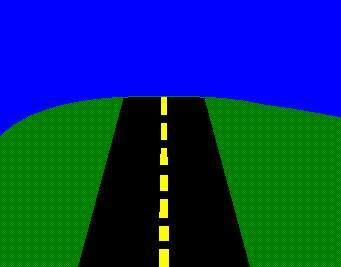 Imagine how a car simulator works... the road directly ahead looks larger than the road behind. That's because the road ahead is larger - taking more screen space... then the road at the end of the horizon. This is the perspective effect we are going to achieve. Now, this does make some assumptions about our coordinate system. It means that we are looking from the origin, and that all our world is in +Z values, or is culled off screen. If we imagined our virtual viewer to be outside the origin (Ie, in -Z), our geometry would not only flip (upside down), but it would also scale nearby objects smaller. To avoid this we will assume our geometry is actually in +Z values before we flip to a perspective view. We aren't quite ready yet however, as we don't yet know how "deep" our screen should be. If we divide by Z, it's quite possible that our object will simply shrink away to nothingness. fScale simply defines how the Z affects our view. Consider like a lens factor. At this point - we are ready to begin our implementation. 1. First of all - we need to define fScale. 2. Since we need to make sure our object exists in positive Z axis, we push it "back" by translation. Hence we need a translation function, at least for Z. Here is a generic one. 3. We need a place to store our translated points... so we add new variable. 6. Voila! We now have a rotating cube with perspective. It looks a bit odd from time to time - but mostly that's relating to the view scale etc... feel free to adjust the cube size / fScale to get things right for your application. 1. We rotate the rotor of a helicopter (rotation along the Y axis). The rotor is centered around the origin. 2. We translate the rotor upwards (according to the height of the cockpit). This means the object can be rendered along side the cockpit and it will "match". 3. We perform any SRT to both the adjusted (rotated / and translated) rotor, as well as the cockpit. This allows us to place the completed helicopter anywhere we want into three dimensional space. The concepts for a simple helicopter extend to all objects that have relationships. These types of spatial relationships are known as an object hierarchy. The most useful area to use an object hierarchy is in character animation. You might start at the torso, add an upper arm, add a fore arm, add a hand (with wrist), add each finger - each with 3 segments. Once we get to render the end of the finger - we will have passed through six joints - and possibly six unique SRT transformations. We need to consider both the orientation of the joint, as well as how and where the bone will connect. The problem however - is that at a certain point we get overwhelmed by all our transformations. Wouldn't it be nicer if there was an intelligent way to group a series of transformations - into a single unit? There is a better way... called Matrices. The ultimate goal of any real time computer graphics is to render to the screen as quickly as possible. While we've defined our transformations, it's easy for them to get unruly, in both complexity and calculation time. Matrices give us a way to reduce the number of calculations performed - while simplifying our work, and improving calculation speed. It's possible to have a single matrix represent a X translation, a Y translation, a Z translation, Scaling X, Scaling Y, Scaling Z, Rotation in X, Rotation in Y and Rotation in Z!!! Talk about one stop shopping! It gets even better. Not only can we represent a series of transformations into a matrix - but we can also perform operations on matrices. So, if we have a matrix that performs a Scaling, but we also want to do rotations - we can combine these two matrices using Matrix Arithmetic. We get a new matrix which does not only the scaling but also the rotation. Computers equipped with MMX or SIMD type systems are especially suited for matrix applications. Direct X includes a library of matrix functions in D3DX - which are optimized to work very efficiently on any cpu. However, for now we'll code them ourselves to get you used to the idea of matrices. Remember that matrices aren't limited to being square or 4x4. It's just as possible to have a matrix with just one row. A set of 3d points (x,y,z) - could be stored in a 1x3 matrix. A 1x3 matrix is also called a vector, which is very useful because it's a "point" in our three dimensional space. Now, assuming that we have a matrix (grid of numbers) and a vector... how do we find out our new x,y,z? We use matrix multiplication to calculate a new vector. Please realize that this isn't your standard multiplication that you learned in grade school. This is matrix multiplication, which defines the shape of the resulting matrix (how many columns and rows), and how to map between your two input matrices and create a resulting matrix. It's not nearly as complicated as it sounds. It turns out that when matrix multiplication was defined, it was defined with a restriction. You can only multiply matrices if the number of columns of the first matrix is the same as the number of rows of the second matrix. Do you notice a problem? I've told you that you can represent SRT transformations in a 4x4 matrix, but we need to use matrix multiplication to calculate the results of a 3 element vector. A three element vector only has 3 columns, which is one shy of the required 4 columns. How do we get around this? Easy - we use the simplest trick in the book and fudge the numbers. To get our resulting transformation, we add an extra element. New Vector <X,Y,Z, ignored> = Old Vector <x,y,z,ignored> * Matrix. We'll set the ignored value to one so it doesn't affect our calculations. It will be used in the matrix calculations - but ultimately thrown away. We can craft specific vector instructions to drop them out at the start - but either way.. they don't get used. So, what does matrix multiplication look like? Let's say we are multiplying two matrices - A and B. We know that A has the same number of columns - as the number of rows of B. This is essential to our mapping. We map the columns of A - to the rows in B. Here I've plotted two matrices. A is a 2x4 matrix. B is a 4 by 3 matrix. The number of columns in A is 4, and the number of rows in B is also 4. So we know we can multiply these two matrices. I've put boxes around the matrices so you can tell which belong together. I've labeled the entries in our matrix as A? * - where ? is the row, and * is the column. Similarly, I've done the same with Matrix B, and Matrix R - our resulting matrix. If Matrix A is a MxN matrix (M rows by N columns) and Matrix B is a NxP matrix (N rows by P columns) we get a MxP matrix. IE, Matrix R will have the same number of rows as Matrix A, and the same number of columns as matrix B. To calculate our result, we multiply according to the intersection of rows and columns in A and B. For example: R11 is the result of multiplying matrix A's first row, and Matrix B's first column. R21 is the result of multiplying the second row of Matrix A and the First row of Matrix B. It's like looking up the timetable of the bus. Every square in the result section, depends on the matrix A values on its left, and the Matrix B values on the right. We still haven't said how it depends - but that's the easy part. We can role it up even further - but I think you get the idea. In review so far - we've shown that points <x,y,z> can be expressed as a 1x4 matrix. We've illustrated that matrices can be multiplied by vectors to transform the vector. We can scale a vector by multiplying it by a scaling Matrix. We can rotate vectors by rotating it by a rotating matrix. I haven't yet shown what those matrices look like - that's the next step. The one thing I want you to learn is this: We don't just use matrix multiplication (also called concatenation) to calculate the result of vectors transformed by a matrix. We use it to multiply matrices together.... concatenating matrices. Matrix C == Matrix A * Matrix B == A matrix that scales and then rotates. It's generic matrix multiplication that allows us to combine all our crazy transformations into a single matrix package. That's what all this fuss (and work) is about. Scales by scale_x, scale_y, scale_z. Notice if scale_x=1, scale_y=1, and scale_z=1 we get a matrix that doesn't affect the geometry. This is called an identity matrix, as any matrix * Identity = the same matrix. Identity matrices can be easily recognized as they have zero for all values except the diagonal - (top left to bottom right) which is set to one. Our first step will be to introduce some new functions: Specifically, functions to multiply matrices, vectors, and do rotation and translations. Voila! 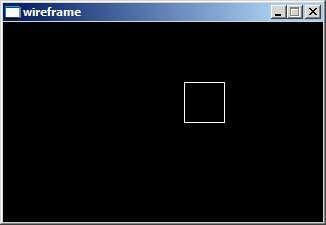 You are now rendering with matrices. This is less efficient in our contrived example of only a cube, but on the whole in a large examples this will be more efficient. If you got lost along the way - catch up with wireframe.i.rar. The end of the Matrix? Well, not exactly. We've only scratched the surface of what's available. Later on we'll dig into Direct X and/or Open GL -> and we'll use the d3dx functions to do our matrix math. However, having coded and mastered this - you've got an unbeatable understanding of matrices. For those wishing to pursue further - do some searching for "matrix stacks". They are very useful for object hierarchies, and are built into Open GL (natively), and direct x (as part of the d3dx library). 1. Triangle fans and strips (a way of representing a shape while reducing the number of duplicated vertices). Well folks, as promised - I respond to reader requests. I haven't decided what's next..... but I'm already looking forward to it. 1. Extension on our Wireframe graphics? Don't forget to cast your vote and email me at: polaris@northerndragons.ca. In the mean time - take care!